This picture of an economy is fine as far as it goes, but it lacks a broader context. 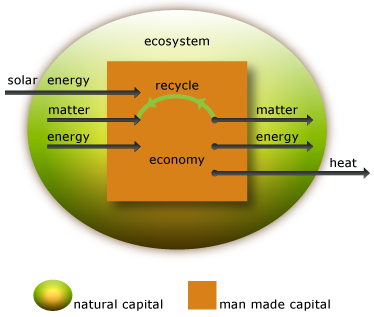 The picture neatly summarizes the limited nature of the matter to which we have access, raises questions about the capacity of the ecosystem to absorb matter (waste) discharged into it from the economy, the extent of recycling, and the what limits there might be to the growth of the economy within the ecosystem. By altering the size of the 'economy' box relative to the size of the ecosystem, it can illustrate the transition we've made from the 'empty world' to the 'full world', where our demands are pressing up against the limits of the ecosystem to supply them. (On the last point, for further references, see The Economics Anti-Textbook, p.253). If the text I'm using were serious about saying anything meaningful about "environmental sustainability", it would have a diagram like this in it.